A popular choice for both residential and commercial applications, an epoxy coating, will do a lot more than make your garage or shop floor look beautiful. It is also one of the strongest, long lasting and most durable coatings that you can apply to a garage floor. Let’s explore some of the reasons why you should consider switching from boring or unattractive concrete to a more beautiful and durable epoxy coated garage floor instead. Make your garage floor stain free: Apart from making your garage floor look great, the hard epoxy coating is very durable and immune to chemicals and stains. Your floor is safe! Covers up flawed concrete: Does your garage floor have any minor imperfections like small spider cracks or flaws in the concrete? A professionally installed epoxy coating is thick and does a great job of covering these types of flaws. Get rid of the dust: Concrete floors are dusty. Most of the dust you find in your garage, the kind of dusty powder that collects on your cars and storage items comes from a concrete garage floor. An epoxy coating, however, is like a topical sealer which will cover up the concrete to make it a dust free floor. That keeps your garage and home a lot cleaner and healthier. Easy to clean during the winter: During the winter months, icy brines, and road salts tend to find their way onto our garage floor. If you had a concrete floor, cleaning would be quite a challenge. But epoxy coating is naturally moisture resistant and can handle chemicals well too. Having an epoxy garage floor makes cleaning during the snowy months a breeze. All you need is a little soap and water. Garage floors are slippery: Most garage floors have a smooth finish. So when they get wet, they are very slippery. A good epoxy coating with slip resistance will quickly take care of this problem and will help you stay on your feet and not on your back! Improves the value of your home: A nicely installed epoxy coating is more attractive in your garage compared to a stained, dull concrete floor. 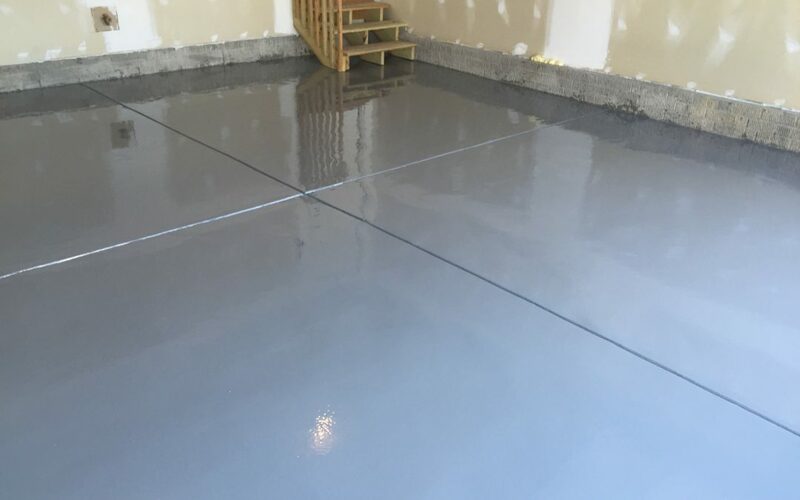 An epoxy coating increases the value of your home to a potential buyer if they know they can move in with confidence, knowing they don’t have to do any maintenance on the garage floor. It’s garage proof: Epoxy coatings are chemical and stain resistant. So if you spill any oil, grease, brake fluids, gasoline or any other car or bike chemicals on your garage floor, there is no need to panic. They can be wiped away easily, even if the oil or chemical sits for a while. Have you tried epoxy coating for your garage or shop floor? Thinking of getting an epoxy coating for your basement floor? Do you have any questions about Epoxy Coating your floor? Let us know in the comments below. We’d be happy to hear from you! Do you have any questions about your concrete? We’d be happy to help you, just leave a comment below or use the form below to Contact Us. Simply fill up the form below and we’ll get back to you within 24 Hours!